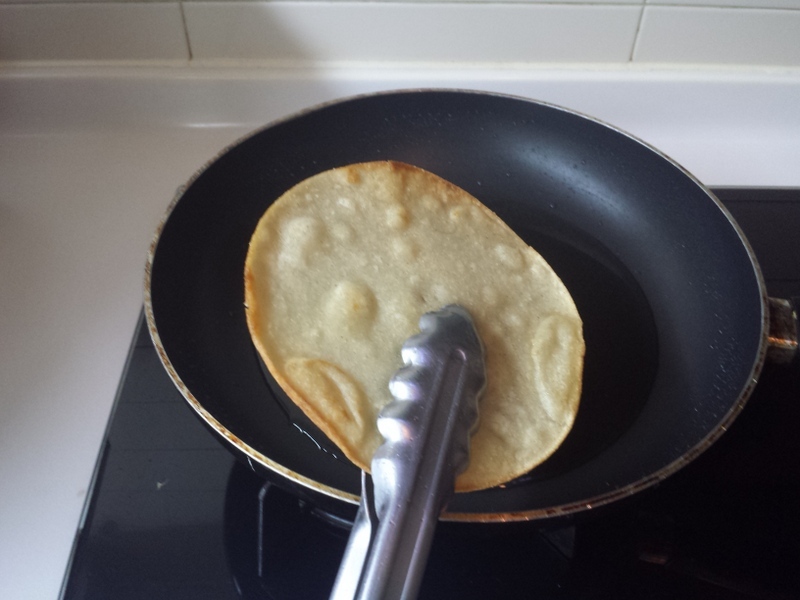 Pan frying your own corn tortillas only takes 5 minutes and makes all the difference so don't resist the urge to substitute bagged chips. Otherwise, everything else is as straight forward as cooking scrambled eggs with sautéed veggies. 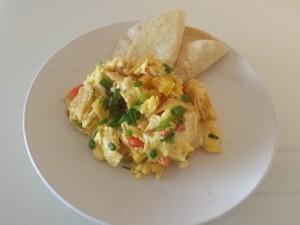 There are many recipes for migas and all are similar so customize for your family's favorites. In a medium bowl, whisk eggs with milk then set aside. Turn on non-stick skillet to medium heat, add canola oil, enough to coat skillet approximately 2 tablespoons. 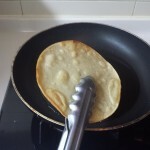 When oil is hot, place one tortilla in oil, moving around gently with tongs for about 15 seconds, then turn over for additional 15 seconds or until crisp. Remove and drain on paper towel. Repeat with second tortilla, turn off heat. Dice up fried tortillas into small strips. Remove oil from pan, add butter to skillet and turn on medium low heat. Add red and yellow bell peppers and gently cook for 2-3 minutes. Pour in eggs and gently scramble, moving eggs around pan. When eggs are still wet but partially cooked, add cheese, half of the diced green onions and the fried tortillas, continue moving around pan. Serve with warm tortillas and remaining green onions as garnish. This version is inspired by my memories of eating Migas from Good Eats in Dallas, TX, minus anything too spicy for the kids! I think Migas is delicious and healthy, also refreshing because it has protein and peppers. I think it’s a good morning breakfast and I do cook Migas too!